Friday roundup: Coyotes seek investors, Detroit MLS stadium deal maybe not dead after all, and new stadium fireworks renderings! Arizona Coyotes owner Andrew Barroway is looking for more investors in his team, and if I owned the Coyotes I’d be trying to find someone to take chunks of it off my hands, too. Barroway also said that the Coyotes won’t remain in Glendale long-term, but that he “wouldn’t focus on Arizona moving right now or any time soon, or maybe ever,” so apparently his plan is to stand around the Phoenix area holding his breath until he turns blue if no one else will give him a new arena. The owners of the Golden State Warriors say they shouldn’t have to pay off the remaining debt on their Oakland arena when they move to San Francisco, as their lease requires, because their lease expires after 20 years while the debt goes on for 30. Just thinking about this makes my head hurt, so good luck to whatever judge ends up with the case. The Rochester Rhinos aren’t getting evicted from their stadium after all! They’re still not fielding a team in 2018, though, and I’m not clear on whether it’s been decided who owns their office furniture. Michigan’s Wayne County has agreed to give its unfinished jail site to Cleveland Cavaliers owner Dan Gilbert, meaning Gilbert’s plan to build a new MLS stadium there and a new jail on city land while getting $300 million in county subsidies may not be dead after all. Though the state still needs to approve the tax kickbacks, and the county commission and the Detroit city council both need to approve the land swap, so … reply hazy, ask again later. An appeals court in Arizona has ruled that the state’s car-rental tax to pay for building sports venues isn’t unconstitutional after all, overturning a lower-court ruling from 2014 that it was illegal because money from car taxes needs to be used to pay for highways, and stadiums aren’t highways. Next up: state supreme court! Arlington, Texas is offering to spend $10 million on an e-sports arena, because that’s just what Arlington does. At least the city claims the money would be repaid by lease and event revenue, but I’d like to see the actual lease, please, to be sure of that. Inglewood residents spoke out against a planned Los Angeles Clippers arena and fears that it would displace businesses and residents at a public meeting this week, to which Inglewood Mayor James Butts responded: “I don’t know of any residents that live in the state of California that are upset.” Oh no, it’s outside agitators! Phoenix Rising F.C. has released renderings of its proposed MLS stadium on Salt River reservation land in Tempe. Do they have fireworks? You bet they have fireworks! Friday roundup: Pistons disguise empty seats as other-colored empty seats, Olympics tourism is bad and likely to get worse, Suns have no clue about arena plans, and more! Pyeongchang’s surge in tourism for the Olympics is unlikely to be sustained in future years, according to a study that shows tourism levels quickly drop back to normal, when they even have an Olympic uptick in the first place. (Overseas visitors to London were actually down in the summer of 2012.) Given that you can still walk up and buy tickets to most of this year’s Olympic events, I wouldn’t count on it being an exception to the rule. Hope the locals enjoy all those new hotels! Phoenix Rising F.C. is designing a new MLS-ready stadium on the site of its current temporary stadium on the Salt River Pima reservation, and claims it will pay the whole $250 million cost. That would sure be nice, but then that’s what we were told in Sacramento, too. The Koch brothers’ Americans for Prosperity is sponsoring bills in state legislatures that establishing bans on spending public money on pro sports stadiums, which would kick in as soon as 25 states agreed to join the compact. 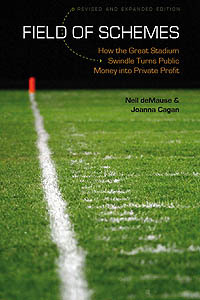 Better they spend on that than on trying to buy Congress, certainly, but as sports economist John Vrooman noted to the Arizona Republic, this wouldn’t stop the other 25 states from continuing to spend to try to lure teams, at which point the whole system would break down. Vrooman said really any legislation needs to happen on the federal level, and “unfortunately for local taxpayers held hostage, that ain’t gonna happen anytime soon.” You gotta believe, John! The projected cost to restore Miami Marine Stadium — remember Miami Marine Stadium? — has risen from $45 million to $59.6 million, and Miami has only $50.4 million set aside to pay for it, and yeah, that’s not good. If you were wanting a long, fawning profile of the Golden State Warriors COO in charge of building their new arena, the Associated Press is here to serve. I’m more interested in the accompanying photo of a giant model of the arena, which makes the upper deck seats look kinda crappy thanks to an intervening clot of suites and club seats, but other images that show the end seats make it look not so bad, so I’ll withhold judgment until somebody (maybe even me!) sees the new place with their own eyes. Hey, Phoenix Suns president Jason Rowley, how are your arena plans going? “‘What’s the best solution?’ It hasn’t been figured out yet.” Are you thinking of going in on an arena with the Arizona Coyotes? “There really hasn’t been a whole lot of conversation between us and the Coyotes.” Any hints at all about what your plans might be? “There are so many pieces to an arena conversation that it’s very difficult to identify one thing that would either be a go-forward situation or one thing that would impact where you’re ultimately going to end up.” The Suns have an opt-out in their current arena lease in 2022, so expect more heated rhetoric once we get closer to that date. The Detroit Pistons are putting black seat covers over the red seats at their new arena during their home games, to make it less obvious how many empty seats there are. The covers are removed for Red Wings games, because the Red Wings’ team color is red, so I guess for them it’s not embarrassing, it’s promotion of their brand? The Pistons are also letting fans move down from the upper deck to the lower at no cost to make the empty seats look less bad on television. Hope Detroit is enjoying all that economic development! At least Detroit got lots of local construction jobs from the arena, and that’s one thing no one can take away! Unless you believe the claims of a local construction worker’s lawsuit against one arena contractor, which says he was only hired to meet the project’s 51% local hiring quota and then immediately fired, while at the same time suburban workers were brought in under fake addresses. And even then, city data shows that only 27% of total workers on the arena project lived in Detroit. MLB commissioner Rob Manfred says he approves of the Tampa Bay Rays‘ preferred Ybor City site for a new stadium — it’s literally his job to say this, so no surprise there — and has told Tampa business leaders that they need to be “engaged in this effort” because “it’s good for community over the long haul.” He then added, “It’s crucial that we get a facility here that allows the Rays to get more toward the middle of the industry in terms of their revenues,” which pretty much sounds like, Hey, local corporate titans, one of your brethren isn’t making as much profit as he’d like, please give him a bunch of your money so his bank balance looks better, okay? More power to him if that sales pitch works, I guess, but I’m in no way confident it will take a significant bite out of that $400 million-plus funding hole, and remain concerned it’s mostly misdirection so that whenever the Rays eventually go to taxpayers hat in hand, they can say, Look, the business community is already chipping in, you gotta do your part too, capisce? Phoenix Rising FC is partnering with the Salt River Pima-Maricopa Indian Community and the Solanna Group, which is a real estate company owned by members of the Salt River Pima-Maricopa Indian Community, to construct a new, soccer-specific MLS stadium. No tax breaks or funding from the state of Arizona or federal government will be provided that are not normally offered to real estate projects in Native American communities. Stadium construction costs will be repaid from revenues generated by ticket, merchandise, food and beverage and sponsorship sales. That’s a lot more specific, and helps rule out such things as tax-increment financing or other public kickbacks, which is definitely reassuring. The question then is what that “not normally offered to real estate projects in Native American communities” clause means. Salt River is the same site that was considered and rejected for an Arizona Coyotes arena last year, so we have at least a little background on what kind of tax advantages a venue on Native American land would receive. The Salt River reservation has the same sales tax rate as Scottsdale (7.95%, marginally lower than Phoenix), but it promises other unspecific tax benefits. One of these could be a property-tax exemption for land owned by the reservation (same as for land owned by other governmental entities); if Salt River continues to own the property (or even just “has control over” it, which is considered the same thing by Arizona law), this could save Phoenix Rising a few bucks. The income of a corporation owned by an Indian tribe or tribal member is not subject to Arizona’s corporate income tax if its income is derived from businesses located on the reservation. Income from a corporation not owned by a tribe or tribal member, regardless of whether it is located on a reservation, is subject to the state corporate income tax. Corporations owned by tribes or tribal members that derive their income from non-reservation sources are subject to the income tax in the same manner as all other corporations with income in Arizona. Again, if the ownership is structured right between Phoenix Rising, Solanna, and the reservation, there could be some tax benefits here, though it’s tough to say how significant they’d be without knowing more details. Anyway, this is all reassuring, though I’ll still be eagerly awaiting a fleshed-out stadium funding plan. A typical MLS team brings in maybe $30 million in annual revenue, out of which it has to pay player payrolls (generally less than $10 million), plus other expenses; adding on $10-15 million a year in debt payments (if we’re talking about a $200 million stadium) would take a hefty chunk out of their ledgers. It’d help if they can keep costs down, but given they’re talking about a “climate-controlled” venue … I’m interested to see how it all pencils out, let’s just put it that way. In the mood to read an entire article about a new stadium plan that never discusses how much it will cost or who will pay for it? Then Soccer Stadium Digest has you covered! In May, the club secured financing with Goldman Sachs, which recently structured both Banc of California Stadium in Los Angeles and Audi Field in Washington, DC. It’s entirely possible that Phoenix Rising is set to build a new stadium on its own — as Orlando City SC (mostly) did — in which case it’d be worth applauding. (As much as one should applaud a private business for doing what private businesses should do without trying to fob costs off onto the public.) But it appears that the USL club’s owners aren’t being very forthcoming about their cost or funding plans beyond “don’t worry about it,” and the Phoenix-area and soccer media isn’t pressing them on it, which, c’mon guys. It’s fine to be excited about a possible new MLS team, but try to remember to do your jobs while you’re at it.